July in San Francisco is always an amazing month! Let’s join EC this month on some fun activities in the city! The school plans a variety of activities for students with teachers, staff and student ambassadors. All accompanied activities in orange require a 5-student minimum, so it is very important to sign up. Most of the activities are free of charge but some of them requires a small contribution. Please pay for tickets and weekend trips at the front desk. Some of the highlights for this month include Kayaking in the Bay, BBQ in Golden Gate Park, Giants Baseball Game, as well as so much more. 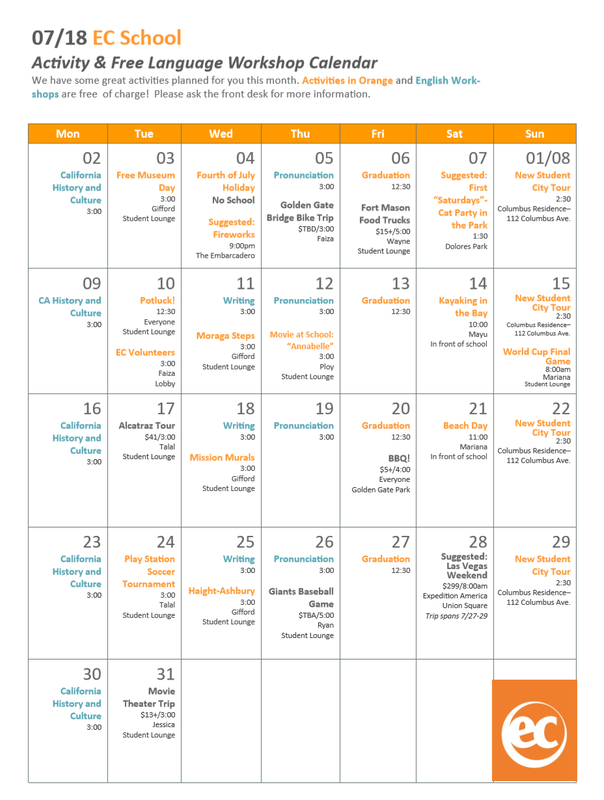 Check out the July activity calendar to know all the activities for the next weeks! Are you interested in studying in San Francisco? Check out our English courses in San Francisco!